Dottore Gianni is really anxious to travel, but alas, as usual, he has no money to pay for the many trips he dreams about. 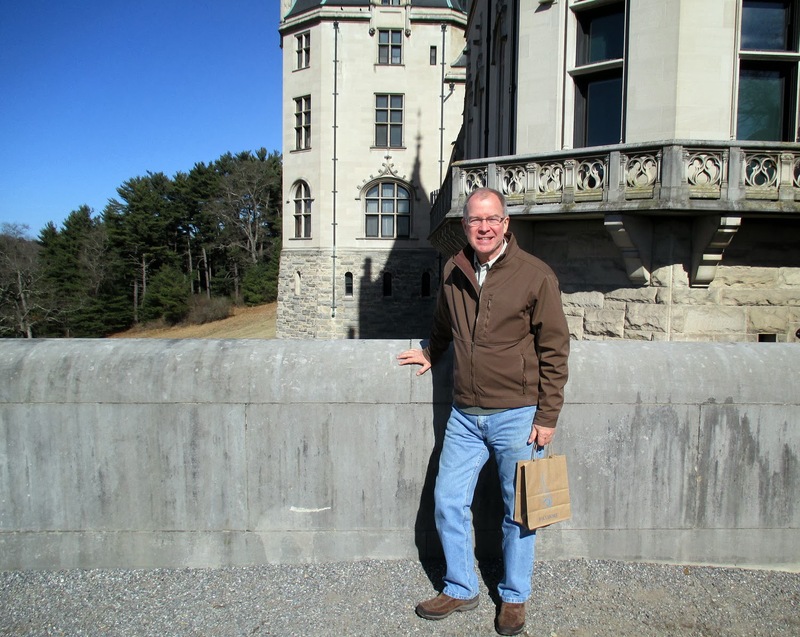 But there are mini-adventures to be had, and yesterday (two days after he turned 67) he embarked for a morning and early afternoon about an hour’s drive north, in the mountains of North Carolina at the Biltmore Estate! Anyone know who “bilt” it? Well, take the first syllable of the name, de-capitalize it and place it after the first two syllables of prominent American family name and you’ll have it – Vanderbilt. George Washington Vanderbilt to be exact, grandson of Cornelius, the self-made man who went from running a small ferry service to become one of the richest men in the world, making his fortune first in ships and shipping, then in the railroads which took the shipped goods cross-country. Cornelius the industrialist tycoon (and probably ruthless and corrupt fellow as well) was dubious about the talents of his son William (George’s father), but William excelled instead in the financial world and further increased the family earnings. By the time George came along, while there might have been something along those lines he might have done, he had two older brothers who ran the family business. In naming him George Washington his father might have dreamed his son would become president. Hell, he could probably afford to BUY his son the presidency! But instead George turned to culture and art collecting. both), who encounter all things Europe including of course the people of Europe who either fall for them or despise them or use them (or all three). The brief bits I read (in good old Wikipedia mostly) and heard (from the audio tour at the Biltmore house) about George reminded me of a character in novels by Henry James or Edith Wharton. 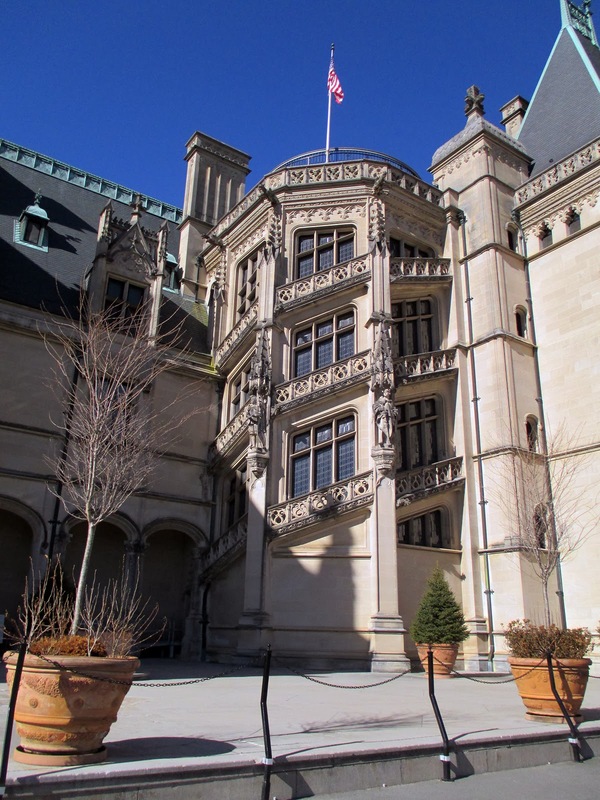 Both in fact were guests at Biltmore – heigh-ho, the Gilded Age! 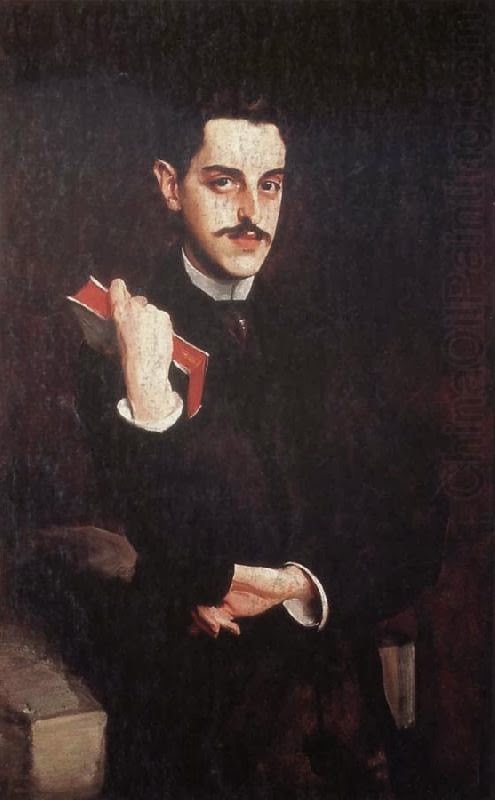 Whilst in Europe (do you like the “whilst?” Henry James did, and Dottore Gianni does) young George bought and bought and bought, amassing a huge collection of arts and crafts. He was forced to, because he had built/bilt the largest privately owned house in America, and he had to fill it with something! example, John Ringling. Ringling and his brothers merged their circus with that of Barnum and Bailey to produce “the greatest show on earth.” And Ringling made a fortune from it. 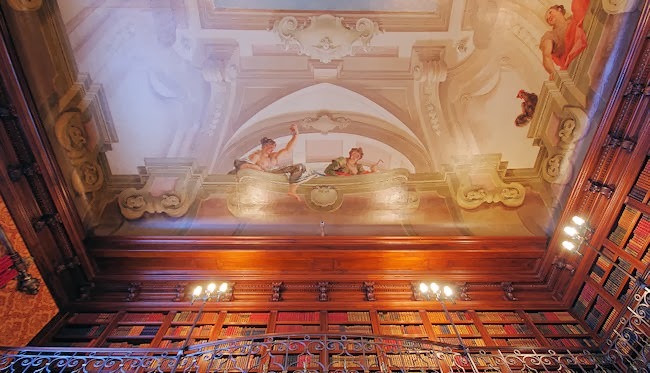 He and his wife traveled extensively through Europe, and as Vanderbilt had before him, bought and bought and bought what grew into I would kindly characterize as a gigantic “eclectic” collection of…well, just about anything. Art, of course, as well as decorative arts & trinkets, as well as theatres, hell, even whole cities! Actually I lie about the last, but not about the penultimate. Part of the Ringling Museum (have you been there? Sarasota Florida? Dottore Gianni has, of course) consists of an eighteenth century theatre from a town in northern Italy called Asolo, which Ringling liked, bought, had it completely dismantled shipped it to the U.S. and re-mantled (???) it at Sarasota. I shouldn’t knock Ringling, as he did buy some impressive work, but then he also bought a lot of junk. But George was, much like Dottore Gianni, a perpetual student. He read philosophy and studied foreign languages, becoming fluent in eight of them. His family had its own home in Paris, and George took advantage of it on several occasions. If the Biltmore House is pretentious (and to a point it is) it is not in my opinion tacky as is Ringling’s. And it was bilt/built thirty years before the Ringling house, Biltmore in 1895, the Ringling in 1924. I imagine that Ringling might well have seen Biltmore on his travels across America. If that’s the case, it’s too bad he didn’t learn more from it. American school of architecture and the American Institute of Architects. He was very influential on younger architects as well, including Louis Sullivan. Probably his best-known work in America is his elegant design for the Metropolitan Museum of Art, but he also designed the pedestal for the Statue of Liberty and several brilliant private homes, including the Marble House and the Breakers, both in Newport, Rhode Island, as well as Biltmore. 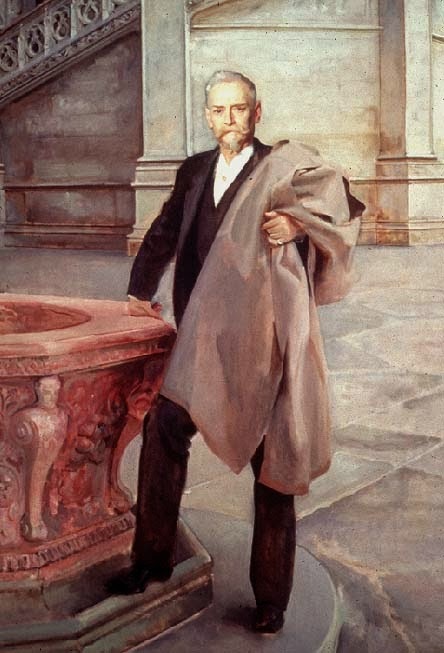 If you take the tour of the house one of the many paintings that will be pointed out by the audio guide is that of Hunt, painted shortly before the architect’s death by the great John Singer Sargent. 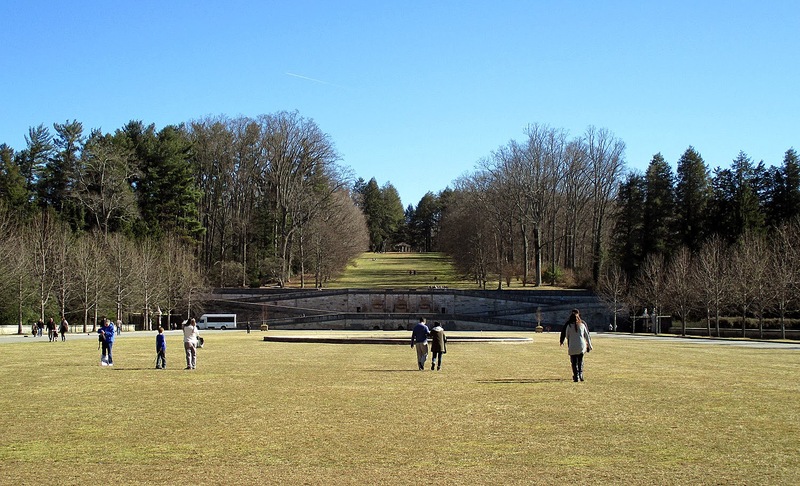 chose well in naming Frederick Law Olmstd, often thought of as the father of American landscape architecture. He was a prolific designer, but easily the most famous and surely the most visited is that of Central Park, in New York City. Thank the building gods for Olmstead, as without Central Park, New York would be even less green than it does. In addition to being one of the finest layouts for any park anywhere, it also functions as the “lungs” of Manhattan. 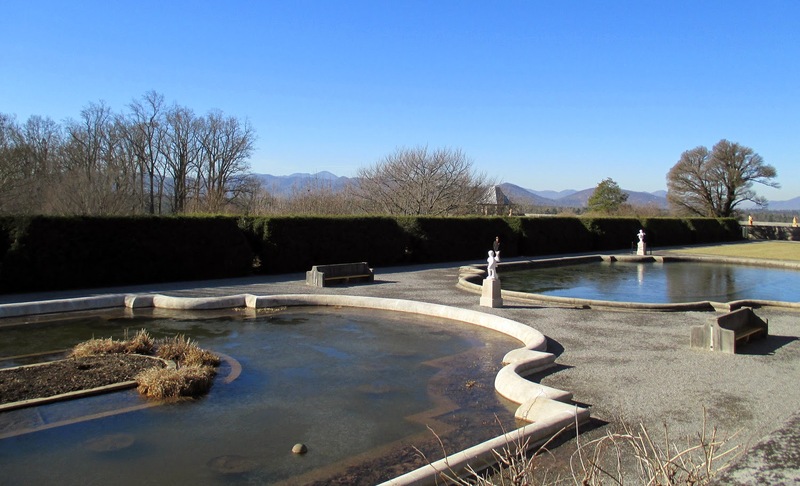 Of course Olmsted’s gardens at Biltmore, which include those in the French and English styles, are barren in mid-January, so I did not receive full effect from them, but they are, I am told, an appropriate complement to Hunt’s French Renaissance architecture. Garden on the left side of the house as you face it - not much now, but in the spring...? New Amsterdam, later, when the British took it over, named New York. The couple were “progressives” socially, and if not exactly Bill and Melinda Gates, engaged in a fair share of philanthropic works. Edith sponsored literacy programs and educational initiatives, and both husband and wife were ardent conservationists. 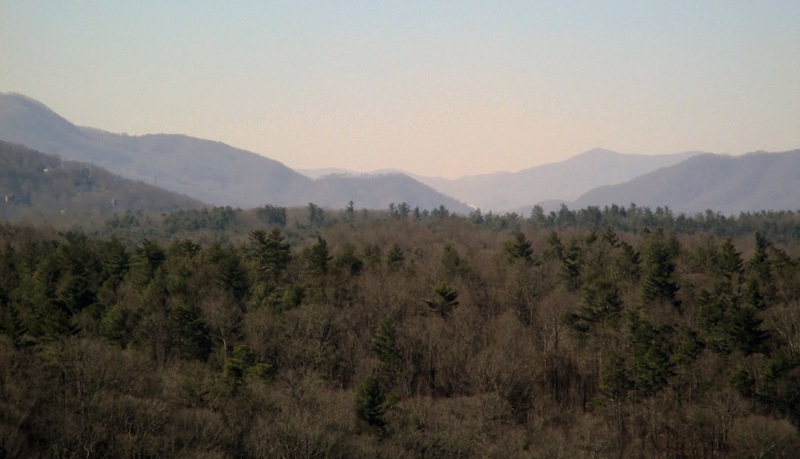 George ran Biltmore as a self-sustaining estate, and its forest was the first professionally managed forest in the U.S. 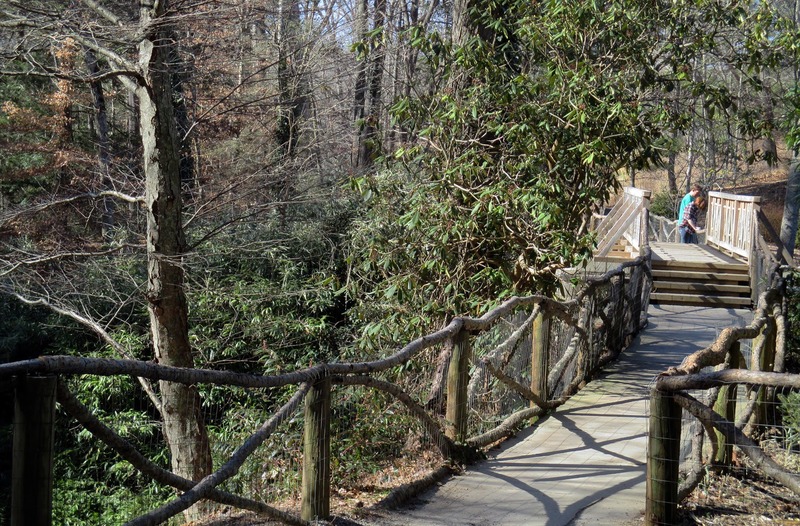 In 1898 the Biltmore School of Forestry, was created. 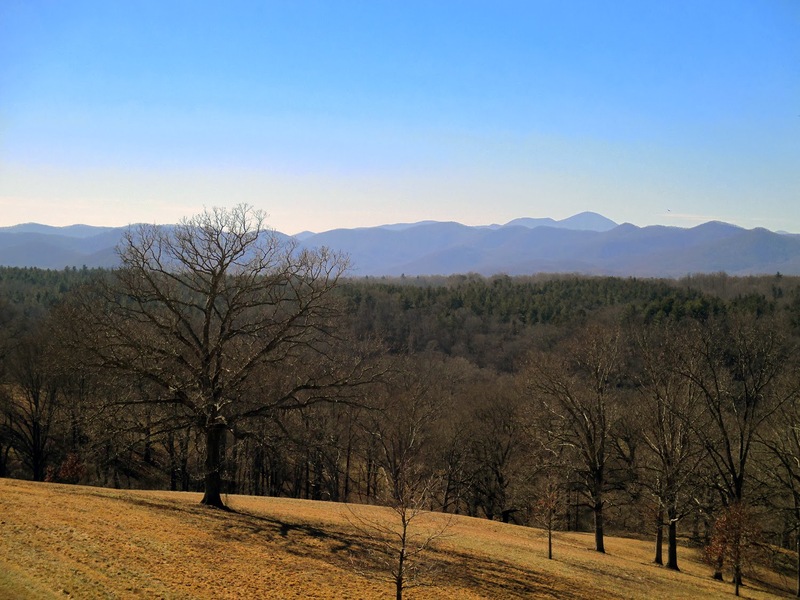 also the first of its kind in the U.S. After George’s death in 1914, Edith sold 85,000 acres of Biltmore property to the federal government, which formed a significant part of the Pisgah National Forest. 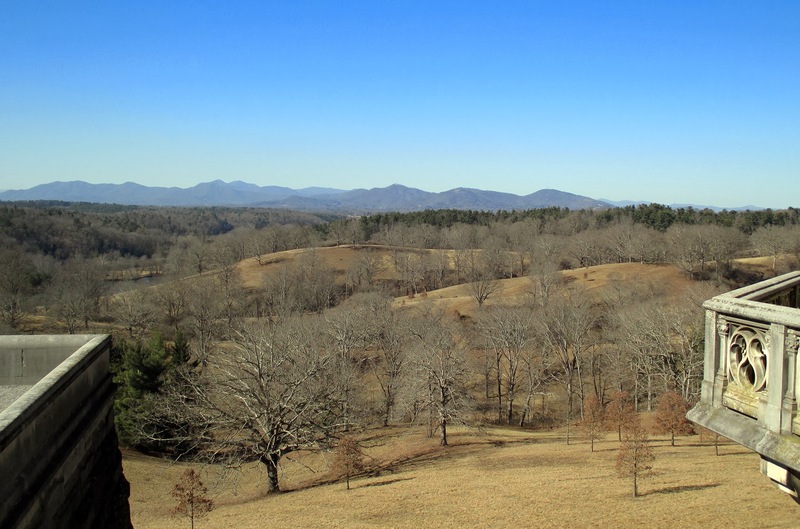 Don’t worry, today the estate retains 8,000 of what was once a 125,000 acre property. So while I came to Biltmore thinking to see a Versailles “wannabee” and have a good laugh at the very rich (who, as F. Scott Fitzgerald noted), “are different from you and me,” I have gradually become fairly impressed with George, Edith and Biltmore. 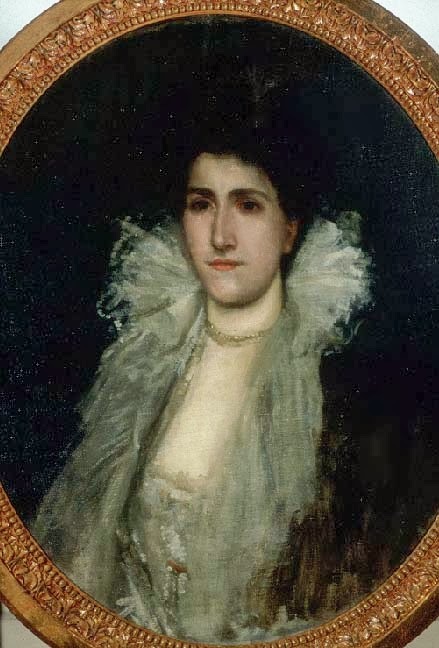 http://www.romanticasheville.com/Biltmore/biltmoreguide.pdf – I discovered that indeed at least one Whistler (a portrait of Edith Vanderbilt) is on view, but as noted above, the audio guide did not mention it, and I missed it. 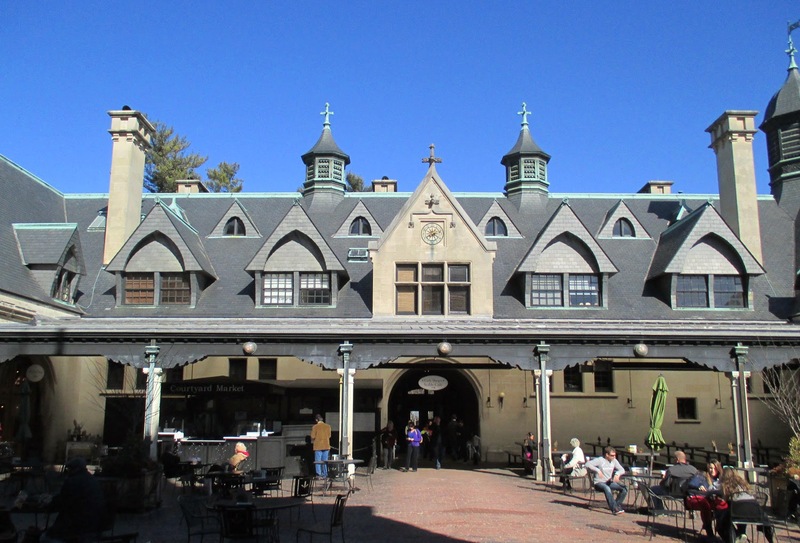 Brief sidebar on the quality of the audio guide: While it was a very detailed tour, Dottore Gianni found that it stinted on the historical/cultural aspect of Biltmore, as does the website for the estate. It seemed to the good doctor that more might have been said about Hunt and Olmsted certainly, and also more about some of the works of art we passed. I read in Wikipedia that among the objects in the house is a chess set owned by Napoleon, but neither audio guide nor the website mentioned it, though it was mentioned in the romantic asheville website (see above). The chess set is not of vital importance perhaps, but certainly it’s a point of interest. Ah well! There you have it! No one (except perhaps Dottore Gianni) is perfect! Pellegrini, The Chariot of Aurora, taken from the Pisani Palace in Venice. In addition to collecting books and paintings (and painters) George also had a passion for prints, etchings and engravings, amassing more than 1,600, many of which are on display here. I noticed two that I immediately recognized in the billiard room (men only, thank you very much! ), portraits of the English playwrights William Wycherley, the Restoration rogue who wrote one of the naughtiest comedies of that ere, The Country Wife, and Richard Brinsley Sheridan, who, writing 100 years later, emulated Wycherley and the other Restoration writers skilled in comedies of manners in his own works, including The Rivals and The School for Scandal – a well-placed juxtaposition! There are also some beautiful sixteenth century Flemish tapestries on display in a room called, Oddly enough, the Tapestry Room. Well, enough of the house, which I highly recommend if you can afford the steep price of entrance to the Biltmore Estate, $50 per person. Dottore Gianni certainly cannot, which is why he is so grateful to his old friend and former boss, Bruce Halverson (another Dottore), who gave him a free pass to the estate, handed out to members of Biltmore (which Bruce and his wife Nancy are) in the slow season, January and February. My Brunswick stew, and tasty brew! splurge on lunch, which he et just after the tour. 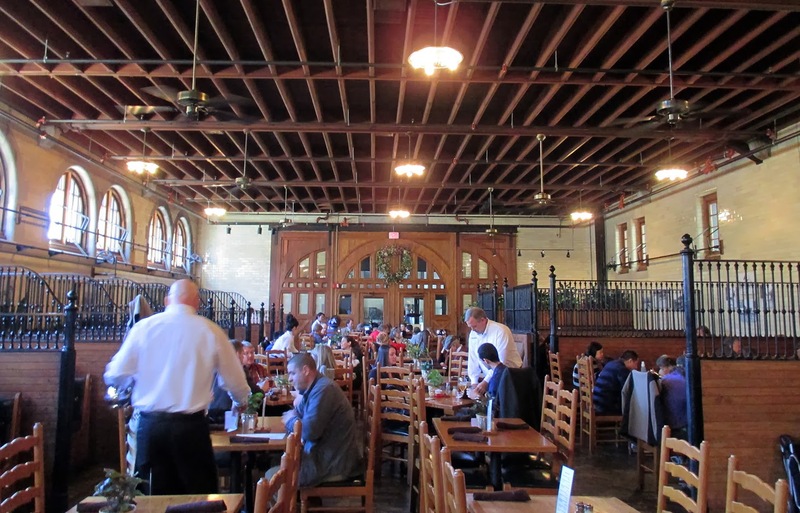 There are several places to eat at the Biltmore house, all that I saw in the area that once housed the stables. I chose the Stable Café, pricey but VERY nice! 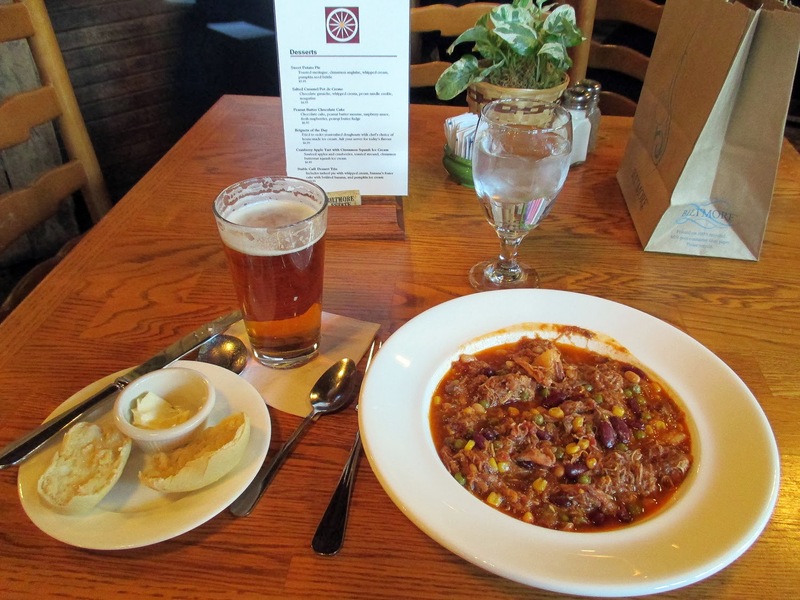 The service was excellent, the best I’ve had since arriving in South Carolina more than a year and a half ago, the beer (a pale ale brewed especially by or for the estate) very tasty and the Brunswick stew absolute Southern-style food heaven! After lunch I strolled around the grounds a bit, focused mostly on the backside of Biltmore house, not so much for itself as for the view from it: hills filled with pine trees, a waterway (probably the French Broad River, which flows through the property) and behind them a lovely array of North Carolina mountains, Mount Pisgah among them. One look and anyone can see why Vanderbilt chose to place his large estate where he did. house through the rest of it to the exit another two miles. On the carefully managed route from the house to the exit there are many hiking and biking trails, some horse trails as well with an equestrian center (special permission only for that) along with a deer park and a “village” consisting of a few eateries, a winery and a gift shop or two. I stopped at the last, above which is also an inn for those with the time, inclination and cash to spend a night or two at this place. I had some time and a little inclination, but no cash to speak of – for the third time (and the third is the charm) “the very rich are different from you and me” and even the slightly rich are different from Dottore Gianni! 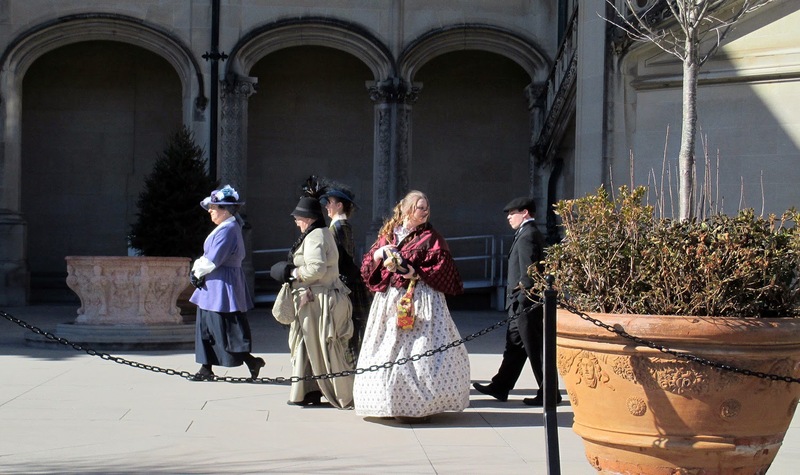 And that, saving the drive home, was my day at Biltmore – elegant or wretchedly excessive? I arrived certain that I would find it the latter, but I left with leanings toward the former. Thus, a day well spent, thinks Dottore Gianni. And in these matters he is seldom wrong.